We have redesigned and implemented new web presentation for Quinta Essentia. Quinta is creative and production agency, specialised in providing learning and team building events. 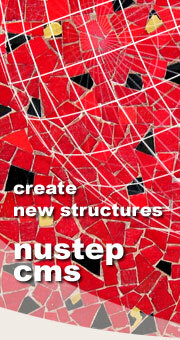 NUSTEP has developed complex intranet solution interconnected with web-presentation for LIC. Database is managed in NUSTEP CMS. Website design is currently under construction. NUSTEP, in coopereation with CORE4, developed new web-presentation for UNITEAM company. Web-site is managed in content management system (CMS). Our company developed new web-presentation for Pontis Foundation. Graphic design, structure and navigation had been created. Content is managed in NUSTEP CMS. Web presentation of slovak folk group Zuzana Homolová and Samko Smetana. Content of the presentation in managed using NUSTEP CMS. Web presentation of an international student organization providing study in Australia. The presentation is created in multiple languages, it includes database of available schools and courses, discussions and search. Content of the website is managed using NUSTEP CMS. Web presentation of SKonline company providing team building activities. Content of the website is managed using NUSTEP CMS. Web presentation of the CK Rodo travel agency with online catalog of private cottages, chalets, apartments and guest houses in the beautiful regions of Slovakia. Internet cross-road destined to interesting destinations of the world. The website is focused primarily on travelling, but today it's in the process of transformation to a general culture & society portal. AstroTouch gives you your astrologically most compatible friend or soul mate. Travel agency information system containing modules CRM (customer relationship management) and Accommodation catalogue. Functionality: client and booking database administration, automatic publishing of internet catalogue, accommodation reservation, accommodation searching, printed catalogue generation.